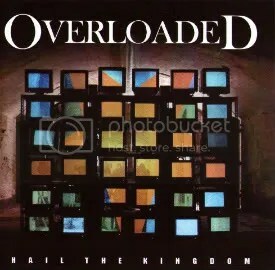 Near as I can tell, 2007’s Hail the Kingdom is a re-issue of 2006’s Overloaded, which itself was comprised of the Hellfire EP and Hail the Kingdom EP (both released in 2005). Besides the somewhat confusing name change, this issue also includes the song “Crazy Horses”, which was a previously unreleased demo and believe it or not is a cover of a rockin’ song by The Osmonds! I was tipped off to this band by a metal message board, sampled the band on MySpace, ordered the album on CD Universe, and then found out later that day on the same message board that the band had split up! I’m not sure when, but it’s true and according to Chris Gillen’s MySpace page, he is now singing for Tokyo Blade. Anyway, for the short time the band was around, they made some great rock ‘n’ roll & heavy metal! Yes, BOTH! In trying to learn more about the band, I see virtually ever site passing them off (with praise) as a throwback to ’80s “hair era”. I don’t see how that’s the only sound they’re picking up here (even if the band has opened for the likes of White Lion, Skid Row and Slaughter), because the band is all over the place with genres, but they do it all well, so I’m not complaining. “Hellfire” and “Heavy Metal Highway” are great NWOBHM sounding songs fully equipped with generic Satanic lyrics. “Shotgun City” and “War of the Worlds” bring the sleaze & glam. “Where Are You Running To?” and “Zygote” are alternative. “King of the Landfill” is punk. “Beaver Fever” is Nugent-esque. There’s also garage & southern rock vibes to some songs as well. Everything sounds awesome though, and my only beef is the recurring theme of Satan: the album art/title and the lyrics that pop up in a handful of songs. I’m not a religious man, but whether it’s tongue-in-cheek or if there’s some “statement” being made, I find lyrics like “sell your soul to the devil, and you’ll never ever have to die” to be lame and unnecessary. Chris Gillen is an exceptional vocalist and as good as the music is, I also love listening to this album just to hear his voice, which seems like a blend of Sebastian Bach and Charm City Devil’s John Allen.